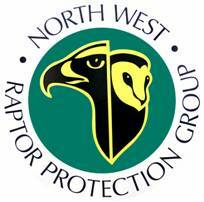 Despite the never ending poisoning, trapping and killing of so called ‘protected’ raptors in our country we are living in a remarkable age of progress for nature conservation. Species like the White-tailed Eagle, Osprey, Red Kite and Goshawk were birds driven to extinction throughout Britain by man’s ignorance and intolerance. It is disappointing those human traits associated with the Victorian Era are still with us today in the 21st century. The National Farmers Union for Scotland (NFUS), published their own Sea Eagle Action Plan in March 2014 calling for controls of Sea Eagle numbers in Scotland. Thankfully the NFUS is unlikely to gain any support from the Scottish parliament in the present climate, but clearly the NFUS’s objectives highlight the animosity still being directed towards the White-tailed eagle from one powerful organisation in Scotland. You can read the NFUS report here. Many enlightened people both in Britain and abroad, will find the NFUS’s position bizarre and a little scary. Ornithologists I have spoken within Norway, Poland and the Czech Republic are completely bemused and astounded at the way Britain’s raptors are being treated. Until recently many of these eminent scientists were of the opinion that Britain’s track record protecting our birds of prey was second to none, an inspiration to other countries, now many are beginning to have second thoughts. In view of what the NFUS are seeking, people must unite to prevent any organisation, no matter how powerful, from turning the clock back undermining what has been achieved so far. We must fight to defeat intolerance, ignorance and prejudice to ensure the once impossible dream brought about by reintroductions is kept very much alive for future generations to enjoy. I have added a link to an inspiring WTE video sent to me by Harald Misund from Norway. For those who don’t know, Harald Misund was responsible for collecting the first batch of White-tailed eagle chicks from Norway in 1974. These eaglets were then transported to the island of Mull to be reintroduced by John Love. Please take the time to watch the video (not in English, but well worth watching). In January 2006, English Nature (Natural England) published detailed proposals for the reintroduction of up the 80 White-tailed Eagle chicks into East Anglia over a period of four years. Plans were already well advanced to bring the first eaglets from Poland where numbers of pairs had increased dramatically in the last decade ( now estimated at close to 1900 pairs). Following extensive hysteria and opposition from influential landowners and farmers, including it is alleged by HRH Prince Charles, Natural England announced the project was being put on hold indefinitely because of financial cut backs. The RSPB, although disappointed at the cancellation of the project insisted it remains committed to returning White-tailed Eagles back to England and intend to investigate other methods of funding a reintroduction scheme, including looking at a number of other release locations in England. Let us all hope that the sensible option of Cumbria is top of the RSPB list! Adult Male White-tailed Eagle – 25m above the ground. There can now be little doubt White-tailed Eagles, since their initial reintroduction north of the border in 1974, are bringing unforeseen economic growth and renewed prosperity to parts of rural Scotland. Increasing numbers of birdwatchers are visiting the highlands and islands each year just to observe, admire and photograph this magnificent avian predator, bringing “tourist pounds” to many rural communities. A study on the island of Mull in 2005 established that eagle-related ecotourism was contributing £1.5 million pounds per annum to the local economy. This financial benefit is now estimated to be at least triple the previous figure. The growing public interest in White-tailed eagles has focused attention on the importance of the Sea Eagles survival to the prosperity of those isolated communities throughout the Highlands. Despite such public interest and support, during the last 40 years White-tailed eagle numbers in Scotland have not increased as expected because of persecution. Many birds are being poisoned, others shot, and we know that tagged WTE’s have simply disappeared, and even nests have been destroyed and one nesting trees cut down. The White-tailed Eagle is one of Europe’s largest and most majestic birds of prey, second perhaps to the larger Lammergeyer found in the French Alps, Austria and now Switzerland. A mature female White-tailed Eagle can weight almost 6 kilos with a wind span of nearly 2 metres. The adult WTE is recognised by its striking pure white tail, immense yellow bill, yellow scaly legs and yellow iris. The head and neck are much paler than the rest of the brown body; the wings are dark brown and much broader than those of a Golden Eagle. White-tailed Eagles take five or six years to reach breeding maturity and can live to an age of 25 or even 35 years. It seems conceivable that the species can breed to an age of 25 years or even longer. 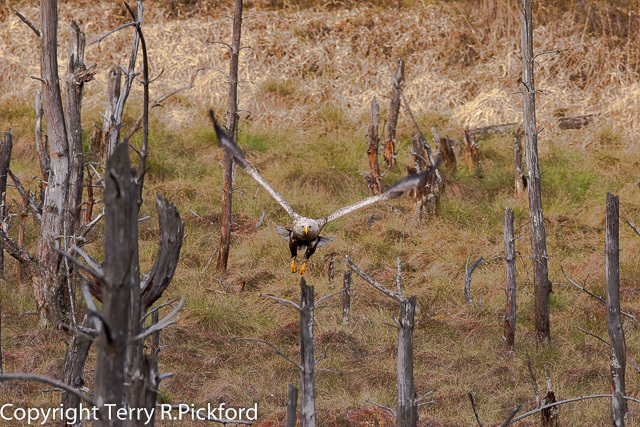 The largest White-tailed Eagle eyrie on record was discovered in Poland. Occupied by the same breeding pair for more than 20 years, this huge construction was positioned 27 meters above the ground at the top of a mature Scots Pine. 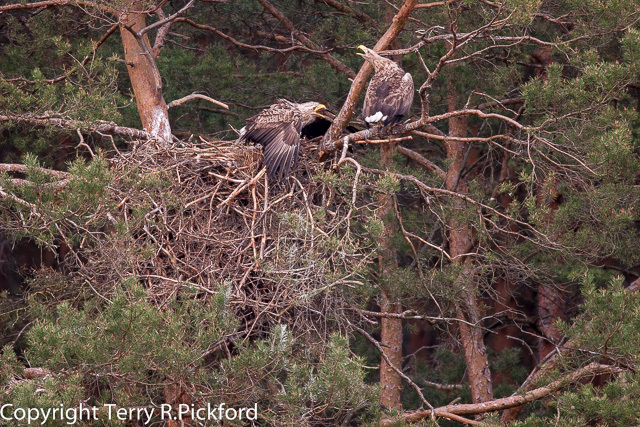 The longest-tenanted European White-tailed Eagle’s nest – the remains of which could still be observed several years ago on Wolin Island along the Baltic coast – was in use for 70 consecutive seasons by succeeding generations. The White-tailed Eagle (or Bielik) is Poland’s national emblem. The Polish population has never been at risk of extinction, thanks to strong historic wildlife legislation dating back as far as 1921. Poland’s White-tailed Eagles have therefore been spared the systematic persecution that occurred throughout the 19th and 20th centuries in Scotland and many other European countries. Adult Male White-tailed Eagle fishing. From just 30 pairs in 1945, numbers in Poland have now increased to well in excess of 1900 pairs. Currently this is the largest population in Central Europe and the Baltic area, and it represents more than 5-7 per cent of the world population. Of the 333 territories examined in Poland in 2000, 198 eyries produced a staggering 287 fledged young. 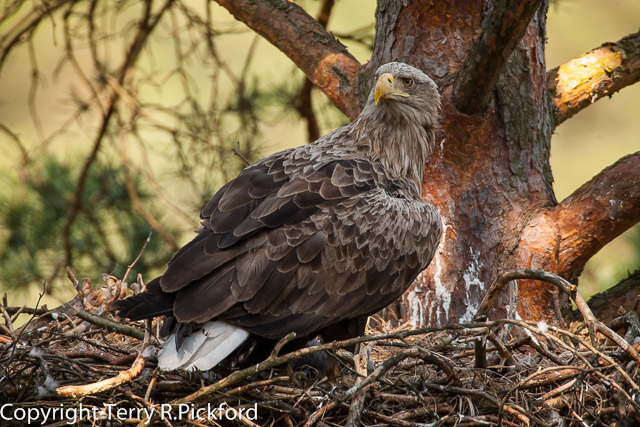 In 2005, of the 80 White-tailed Eagle territories studied throughout the Sierakow Forest, 100 Km east of the German border, 65 per cent of nests examined successfully produced young. 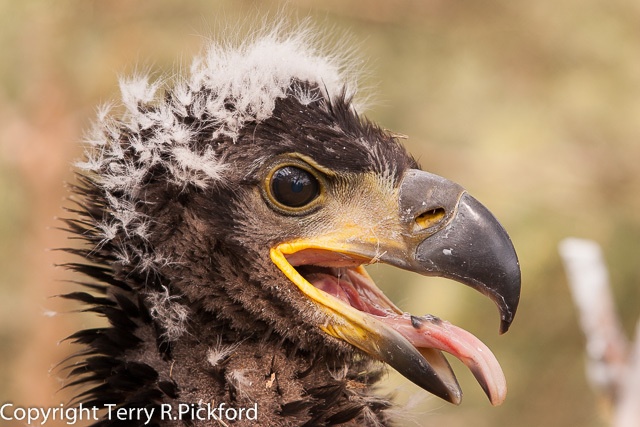 Of the 39 eaglets ringed in the Sierakow Forest in 2005, four nests contained a single eaglet, 13 held two and a further three eyries produced triplets. The high incidence of nests containing triplets in Poland is thought to occurs due to an abundance of prey found in the thousands of fish ponds in many regions of country. As the number of pairs of White-tailed Eagles in Poland continues to expand each year, territories are shrinking in size. In one relatively small area of forest of just 1,300 ha, Polish scientists located seven breeding pairs; a density of one pair per 186 ha. 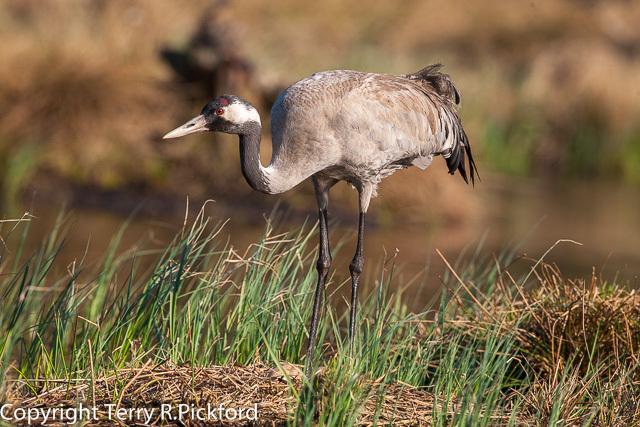 Moreover, nesting habitat choices in Poland are changing. Until the 1970’s Polish WTE eyries were located almost exclusively in extensive mature pine forests (70-80 years old), but an increasing number of pairs are now breeding in smaller forests, constructing their nests in woodlands as small as 10 ha, often where sites are surrounded by extensive fields, farms and near rural villages without being persecuted. A personal dream comes true. My obsessive passion for eagles began sixty years ago, but it was not until 1962 that I observed my first Golden Eagle in Speyside. It was while watching golden eagles amongst the ancient pines of the Abernethy Forest I first met and talked to a one of the Highland’s foremost Golden Eagle legends the late, but never forgotten Seaton Gordon. It was another 22 years, and a photography trip to the isle of Skye, before I connected with the much larger White-tailed Eagle. That single observation made from Peter Urquart’s small fishing boat inspired me to seek out this elusive raptor in Poland, a part of Europe that until relatively recently had been off-limits to western visitors because of the countries isolation behind the iron Curtain. What I found surprising, unlike in Britain, Poland’s White -tailed eagle population have increased dramatically since 1945 resulting from a respect by the Polish people and strict protection which is enforced where needed. Nesting sites for example are protected by a 500 metre circular public exclusion zone throughout the breeding season. Landowners would never permit such a protection measure here in our country I am sorry to say. What does it say about Scotland’s refusal to adopt the Golden Eagle as the country’s national bird? Helping to ring White-tailed eaglets in the Sierakow Forest, as many as 4 eyries visited in one day. Through the efforts of raptor conservation friends in the Czech Republic, a country I had first visited in 1967, it was arranged via their Polish contacts to introduce me to Professor Mizera, a leading Polish White-tailed Eagle expert. 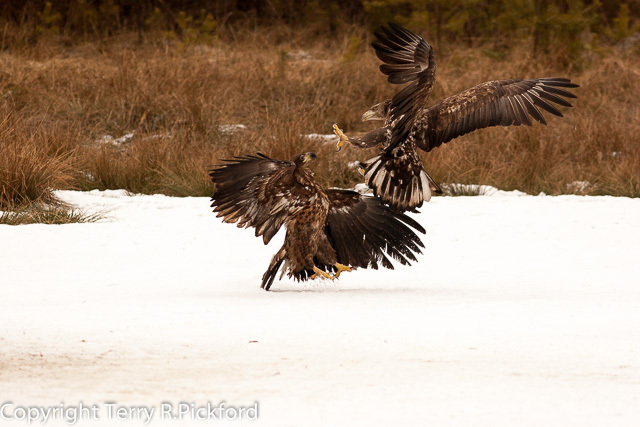 In September 2002 I received an invitation from Poland’s Eagle Protection Committee to visit the Sierakow Forest, a White-tailed Eagle hot spot where I was able to pursue my insatiable interests in raptors. After two years I even managed to obtain the required licence allowing me to photograph White-tailed Eagles within a number of the public exclusion zones. I was now hopeful that I would obtain the images I required within a matter of a few months – or so I thought. What I hadn’t fully appreciated was although I was one of a small number of approved licence recipients, my project would take the best part of another five years to complete. I was away from England for so long during each of the seven years of the project, eventually my wife asked did I have a second family in Poland? During the first few days exploring the Sierakow Forest in the golden autumn of 2002, I was guided by my experienced host Prof. Mizera along seemingly endless forest paths, covered by a soft carpet of lichen and bilberry. The chilly seasonal dampness was already beginning to transform the surrounding forest canopy into a rich multitude of spectacular autumn colours. The pungent aroma of fungi completely filling the still cool moist air as we walked through the eagles’ serene forest kingdom. Each eyrie I was shown measured about 2 metres across and had been constructed at the top of a very high mature Scots Pine. The remains of dead fish and a profusion of discarded feathers and white droppings were clearly visible, scattered in a wide arc around the base of each nesting tree. At one point we heard the yelp of an eaglet from not too far away;at least one fledgling had remained in the territory so late in the season. 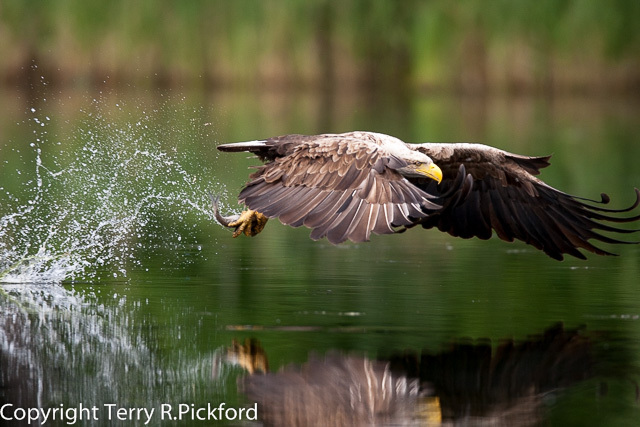 During the next 7 seasons, I spent in excess of five hundred hours photographing White-tailed Eagles at or near the nest, where they hunted and where they bathed each day in the spring and throughout the long hot summer months. On one memorable day, as I was sitting in my hide when I suddenly became aware the eagle I had been admiring through my lens perched at the far side of the woodland fire-break was now flying towards my elevated position, almost 9 metres above the forest floor. With no time to think or focus my lens, I managed to expose two frames as the huge shape vanished from view before alighting with a heavy thud on top of my hide. For the next few seconds I was spellbound, hardly able to move a muscle as the huge eagle began tramping about on top of the hide just centimetres above my head. When my visitor had stopped moving the silence all around me was profound-the only sounds I could hear was my breathing and the pounding of my heart. After a few moments, I gained enough courage to place my eye to a small hole in the wooden roof of the hide, and for an amazing moment I was eyeball to eyeball with an adult White-tailed Eagle looking down at me through the hole. I don’t know who was more surprised, the eagle or me. The bird did not wait around to find out, immediately taking flight into the depths of the forest just as quickly as it had appeared. Throughout this thrilling project, I collected many extraordinary and stimulating memories of the beauty and rich diversity of Poland’s state forests, and enjoyed the first-hand observations of fauna and flora that in many cases have already disappeared from large areas of other over-developed countries in Europe. My experiences, together with the kindness and hospitality I was shown by my Polish host, will remain with me for the rest of my life. I am confident that the time spent sitting in cramped hides with winter temperatures lower than -20 C to obtain some of the images used to illustrate this article have been hours well spent. 10 White-tailed eagles poisoned in Serbia since February 2014 – Annihilation! Farmers in Strathspey are working with conservationists after young sea eagles moved onto their land. White-tailed eagle prejudice is very much alive and well in Scotland.